Levypyörä is a steel structure and wheel specialist located in the town of Nastola, near Lahti. 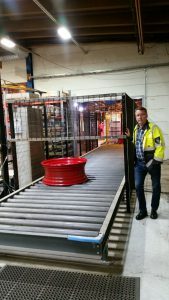 Ferroplan recently delivered the company an L-shaped conveyor system complete with conveyors, rotary table and an unloading unit obtained by Levypyörä. The new system was installed at the unloading end of Levypyörä's paint shop. The objective of the project was to create a single point for the unloading of products from the painting line and quality control, which previously necessitated constant painting line downtime. The new conveyor system provides a 30-minute buffer, during which the employee can complete the finishing, quality control and packaging steps of the final product – in this case heavy forestry vehicle wheels – without the need to hurry, according to the requirements of the quality specifications. Another objective was to enable continuous operation of the conveyor line in the painting unit to minimise turnaround time. Thanks to the new solution, Levypyörä's production rates and paint shop yield have increased. More products can be handled in the same amount of time. No extra workload was caused to the users by the update, and especially the unloader now has more time to unload and inspect the products. The new system has also improved occupational safety. All in all, Levypyörä is very satisfied with the delivery and the high-quality result. Everything was completed on schedule, and the system has worked flawlessly from the first push of the button. 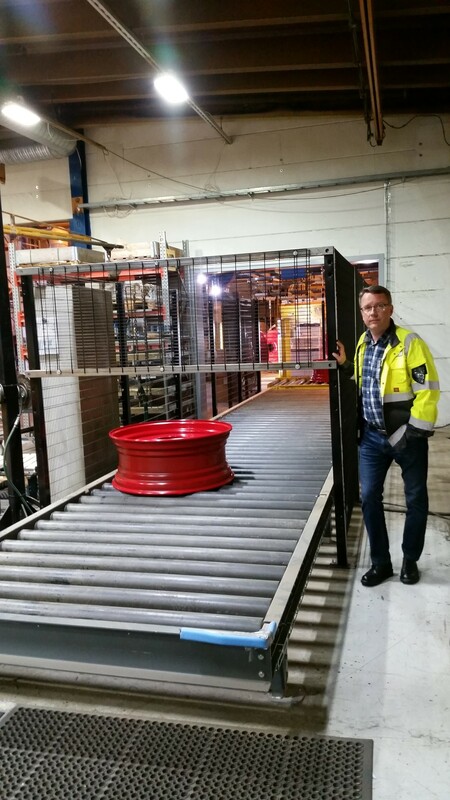 The coating of the rollers used on the conveyor is also first-rate and has shown no signs of wearing, says Levypyörä's production and human resources manager Isko Takala.